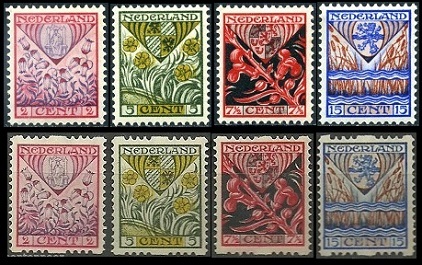 The first Netherlands stamps, issued for the purpose of raising extra money for charitable purposes, appeared at the end of 1906. These stamps are actually postage stamps, intended for use by postal patrons for various types of mail. Later issues are also commemorative stamps, as they honor famous people, places, and events, in addition to their fund-raising purposes. These types of stamps feature a "value added amount" or "surtax amount" in addition to the postal denomination of the stamp. The Netherlands, as well as most other countries of the world, utilizes the added amounts on these postage stamps to raise money for national organizations, public events, and public charities. 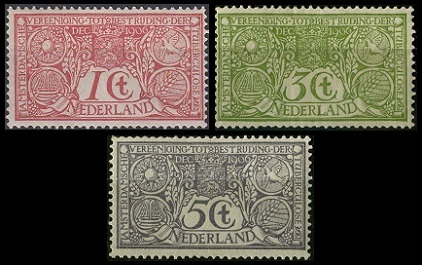 The three Netherlands stamps shown above (NVPH #84-86, Sc. #B1-3) were issued on December 21, 1906 to raise funds for the Society for the Prevention of Tuberculosis. The stamps sold for double their face value, with the value-added amount benefiting the society. The stamp designs feature the symbolic representations of the four contemporary means of fighting Tuberculosis, with them being light, water, air, and food. Mint examples and commercially used examples of these stamps are very scarce. 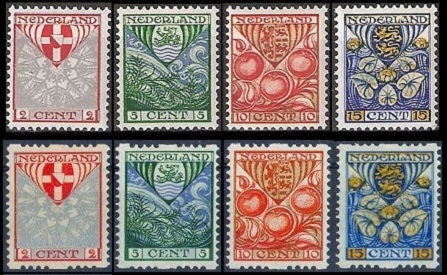 Used examples of these Netherlands stamps that are favor-canceled 'AMSTERDAM / 31 JANUARI 1907 / 10-12N" are plentiful, and they have very little value. The two surtaxed stamps shown above (NVPH #134-35, Sc. #B4-5) were issued on December 15, 1923, with the surtax benefiting various charities. Each of these stamps sold for 5 Cents above its face value. Each of the stamps feature symbolic representations of "giving" and "receiving". The annual tradition of issuing charity stamps every December for Child Welfare began in 1924. In the NVPH catalog, these annual December charity stamp issues are referred to as "Kinderzegels" or "Children's Stamps". The three surtaxed child welfare stamps shown above (NVPH #141-43, Sc. #B6-8) were issued on December 15, 1924. The 2 Cent denomination had a surtax of 2 Cents, the 7 1/2 Cent denomination had a surtax of 3 1/2 Cents, and the 10 Cent denomination had a surtax of 2 1/2 Cents. The designs feature an allegorical representation of "charity" protecting a child. The surtaxed child welfare Netherlands stamps shown above were issued on December 17, 1925. In the manner of the definitive postage stamps of this time, these three stamps were issued both in sheet-format and in coil-format, with the coil stamps having syncopated perforations Type A. All of them are shown above. For an explanation of syncopated perforations and illustrations of the types, please refer to the lower part of the Netherlands category page. 02 C. + 02 C. (1925 - NVPH #166, Sc. #B9) - Arms of North Brabant with a lily. 07 1/2 C. + 03 1/2 C. (1925 - NVPH #167, Sc. #B10) - Arms of Gelderland with a medlar. 10 C. + 02 1/2 C. (1925 - NVPH #168, Sc. #B11) - Arms of South Holland with a rose. 02 C. + 02 C. (1925 - NVPH #R71, Sc. #B9a) - Arms of North Brabant with a lily. 07 1/2 C. + 03 1/2 C. (1925 - NVPH #R72, Sc. #B10a) - Arms of Gelderland with a medlar. 10 C. + 02 1/2 C. (1925 - NVPH #R73, Sc. #B11a) - Arms of South Holland with a rose. The surtaxed child welfare Netherlands stamps shown above were issued on December 1, 1926. These four stamps were issued both in sheet-format and in coil-format, with the coil stamps having syncopated perforations Type A. All of them are shown above. 02 C. + 02 C. (1926 - NVPH #199, Sc. #B12) - Arms of Utrecht with ice crystals. 05 C. + 03 C. (1926 - NVPH #200, Sc. #B13) - Arms of Zeeland with seaweed. 10 C. + 03 C. (1926 - NVPH #201, Sc. #B14) - Arms of North Holland with orange apples. 15 C. + 03 C. (1926 - NVPH #202, Sc. #B15) - Arms of Friesland with waterlilies. 02 C. + 02 C. (1926 - NVPH #R74, Sc. #B12a) - Arms of Utrecht with ice crystals. 05 C. + 03 C. (1926 - NVPH #R75, Sc. #B13a) - Arms of Zeeland with seaweed. 10 C. + 03 C. (1926 - NVPH #R76, Sc. #B14a) - Arms of North Holland with orange apples. 15 C. + 03 C. (1926 - NVPH #R77, Sc. #B15a) - Arms of Friesland with waterlilies. 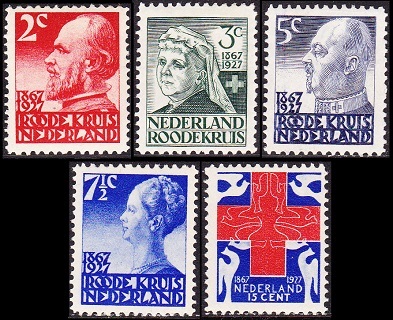 The five surtaxed Netherlands stamps shown above were issued during June 1927 to commemorate the 60th Anniversary of the Netherlands Red Cross Society. 02 C. + 02 C. (1927 - NVPH #203, Sc. #B16) - King William III. 03 C. + 02 C. (1927 - NVPH #204, Sc. #B17) - Queen Consort Emma (King William III). 05 C. + 03 C. (1927 - NVPH #205, Sc. #B18) - Prince Consort Henry (Queen Wilhelmina). 07 1/2 C. + 03 1/2 C. (1927 - NVPH #206, Sc. #B19) - Queen Wilhelmina. 10 C. + 05 C. (1927 - NVPH #207, Sc. #B19) - Red Cross and doves. 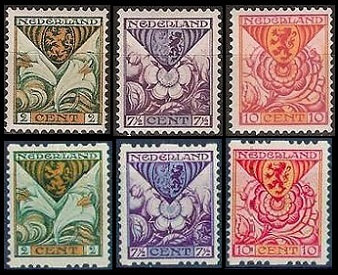 The surtaxed child welfare Netherlands stamps shown above were issued on December 15, 1927. These four stamps were issued both in sheet-format and in coil-format, with the coil stamps having syncopated perforations Type A. All of them are shown above. 02 C. + 02 C. (1927 - NVPH #208, Sc. #B21) - Arms of Drenthe with heather flowers. 05 C. + 03 C. (1927 - NVPH #209, Sc. #B22) - Arms of Groningen with buttercups. 07 1/2 C. + 03 1/2 C. (1927 - NVPH #210, Sc. #B23) - Arms of Limburg with snapdragons. 15 C. + 03 C. (1927 - NVPH #211, Sc. #B24) - Arms of Overijssel with reeds. 02 C. + 02 C. (1927 - NVPH #R78, Sc. #B21a) - Arms of Drenthe with heather flowers. 05 C. + 03 C. (1927 - NVPH #R79, Sc. #B22a) - Arms of Groningen with buttercups. 07 1/2 C. + 03 1/2 C. (1927 - NVPH #R80, Sc. #B23a) - Arms of Limburg with snapdragons. 15 C. + 03 C. (1927 - NVPH #R81, Sc. #B24a) - Arms of Overijssel with reeds.